One of my favorite things about having a baby in the house is watching a new personality emerge. Will he be shy or outgoing? Athletic or intellectual? What personality traits will he get from his father? Will he be like me? In a way I have always loved uncovering pieces of people's personalities, even my own. I love taking those quizes in magazines that promise to break down your personality traits and tell you how to do everything better. Mostly I like seeing if who I think I am matches up with the results. I once had a friend do a handwriting analysis and I was pretty impressed with the results. One of the conclusions was that I was a procrastinator, determined by the fact that I would go back and cross my 't's after I had finished writing the entire sentence. I do like to wait until the last minute to get things done. I am sure my husband would like me to find a test that would explain why I won't ever pick out a restaurant, but will veto all of his ideas. In college, during one of my education courses, we studied personality types and how they corresponded with learning in a classroom. What I took away from that study was that all personality types have positive and negative aspects to them. So we should never try to hide who we really are, we should just search out the positive in our personalities and use them to help us succeed. With the start of a new year, it is always a good time to take a little introspective look at who we are and what we are doing. ArchetypeMe offers a fun challenge to do just that. To discover who you are in order to better understand your interests and connect with others. Their quiz is intended to help you uncover your archetype and the rest of the site is dedicated to curated self-expression and personal discovery, all based on your personality results. You get a personalized website featuring all the stories that interest you and all of the stuff you love. Then you get a forum to share your favorite things with friends. 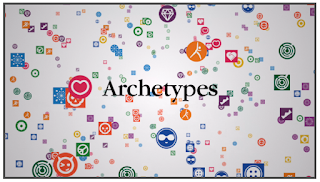 I am taking the quiz to find out my archetype and will share my results with you. Leave me a comment and let me know why you think it’s important to really know who you are and you will be entered to win a $50 Visa Giftcard and a copy of the book Archetypes: Who Are you? signed by author! Then head over to www.ArchetypeMe.com and take their quiz to discover your own archetype. I'm almost equal parts Intellectual and creative. With a bit of Nurturing thrown in. I'm mainly a caregiver, with a splash of creative thrown in. I'm going to ponder on these ideas today and allow it to help me find some motivation to get out of the rut I've been finding myself in. It's important to know who you are so you can achieve what you want in life and to make yourself happy. Also, if you know yourself, others can know the real you, too, and relationships, of all kinds, are better. I think it's important to know yourself because then you're able to more easily make decisions, whether it's about what to do on the weekend, what to order at dinner, or what kind of person to spend your time with. Otherwise, you're likely to spend a lot of time and effort and energy on things that don't bring joy to your life. I think it’s important to know who you are because it helps me understand why I do the things I do and make the choices I make in life. It's important to really know who you are so you consciously make the right choices that affect your life and those around you. Knowing who you are can help with many decisions in your life. I took the quiz and it revealed that I was a Caregiver, creative, and spiritual. That wasn't a surprise to me. My faith is tied to who I am. So knowing that helps me lead a better and fuller life! Knowing who you are means others cannot step on you or treat you badly. When you know your self worth you won't listen to the naysayers. I think it's important to know who you are and what personality type you are so you can focus more on the positive and work with your natural strengths and to also be aware of what doesn't work for you or doesn't come as naturally so you don't get so upset over it. if you dont know yourself you will never see the full potential in you or others! I feel very strongly about knowing who you are and where you can take those talents. There are many out their in th world but knowing your gifts gives you the knowledge to find your way in the world. WOW-here I go for another 50 years. Yes 50 on the 10th of Feb. I think it’s important to know who you are to help you learn and understand yourself and help in areas to grow and be a better person. i don't think it would be possible to live your life to the fullest if you didn't really know yourself! I think it's important to analyze my strength and weakness so I know how to deal with stressful situations. My archetype is caregiver. it's important to be yourself! If you expect others to understand you, you have to understand yourself. That's why it's important. It's important to know who you are so you can get along with and love people in your life. I think it's important to understand who I am so I can learn how to become better- a better mother, family member, friend, etc. It's so important to know who you are because it defines how you work with others and how you approach what life brings to you! When I took the strengths test using a Strengths Finder, it said I was an intellectual, analytical, critical thinker, and empowering. I wasn't surprised that I am mostly intellectual with a dose of creative, but I was surprised about the caregiver part. Sounds like a great way to be more mindful of my strengths & weaknesses. Love it! If I don't know who I really am, then how can I be successful? I need to know. Thanks for the giveaway...sound very enlightening. It is important to know who you are to make better life decisions for yourself. I think it is important to know who you are in order to better plan for the future and utilize your personal strengths. I'm almost entirely Caregiver. I find this highly amusing as I'm not a mother and have no plans to be one any time soon but I am very much a mother hen to all of my friends so I guess it works ^-^. It's important to know who you are to be happy in life! Knowing who you are helps you live a happier and more productive life.